I participated in an Influencer Activation on behalf of Mom Central Consulting for CLn Skin Care. I received product samples to facilitate my review as well as a promotional item to thank me for my participation. While I have always been happy that my daughters received my husband's blue eyes, his tall height and his generous, caring personality, I do wish that his dry skin genes had skipped them. After all, it's one thing for an adult to be bothered by itchy, cracked, sore skin on our hands, knees, elbows and more that come along with dry skin, but it's even worse knowing that our kids feel the same way. What parent doesn't feel bad knowing that their baby or child's soft, sensitive skin is bothered? Which is why I'm thankful that there are products like those from CLn Skin Care that are specially formulated to help my family feel comfortable and happy with soothed, soft skin. Innovative, gentle, non-drying washes that effectively cleanse skin prone to eczema, infection, acne, folliculitis and other conditions, CLn Skin Care products are dermatologist-developed and clinically tested for safety and effectiveness. For anyone with skin issues — whether itchy, red, dry or inflamed skin, athlete's foot, acne, dandruff, psoriasis or many more — including CLn into a daily cleansing routine can make all the difference in appearance, comfort and confidence. While Little Sister B mostly just has sensitive skin, Big Sister E has been dealing with spots of eczema that have been causing her (as well as me) grief for quite some time. Therefore, with summer months and warmer weather approaching, it was definitely time to incorporate CLn BodyWash and Facial Cleanser into our lives! Awarded the Seal of Acceptance by the National Eczema Association, CLn BodyWash is the star of the CLn Skin Care line. This unique product was specifically designed for skin prone to eczema, acne, infection and folliculitis and is safe for children ages six months and older. In fact, CLn BodyWash can be used from head-to-toe as a common treatment for eczema, as this innovative, gentle, non-drying cleanser calms and soothes skin and reduces the appearance of redness and dryness while also effectively cleansing skin prone to acne and infection. Considering all we had to do was add this to our bath time routine (simply lather it on at the end of the shower or bath and leave for 1-2 minutes before rinsing), it was time to get CLn involved in soothing my girl's sensitive skin! This really couldn't be much easier to use and, after incorporating CLn BodyWash into Big Sister E's showers and baths for the past three weeks, we've been really happy with the results! Instead of being bothered with dry patches, we can look forward to a summer with much less irritation and sensitivity! Whether used daily, every other day or as often as your own skin dictates, we're happy to have been introduced to CLn BodyWash and the way that it can calm and soothe skin prone to eczema and other sensitive skin conditions. I have also been periodically using CLn Facial Cleanser and have thus far been pleased with the way that it has improved the appearance of redness and has minimized tightness, stinging and other symptoms of sensitivity on my face. Overall, I can see why CLn Skin Care is a great way to include high quality, effective, clinically-proven products into any family's regime. 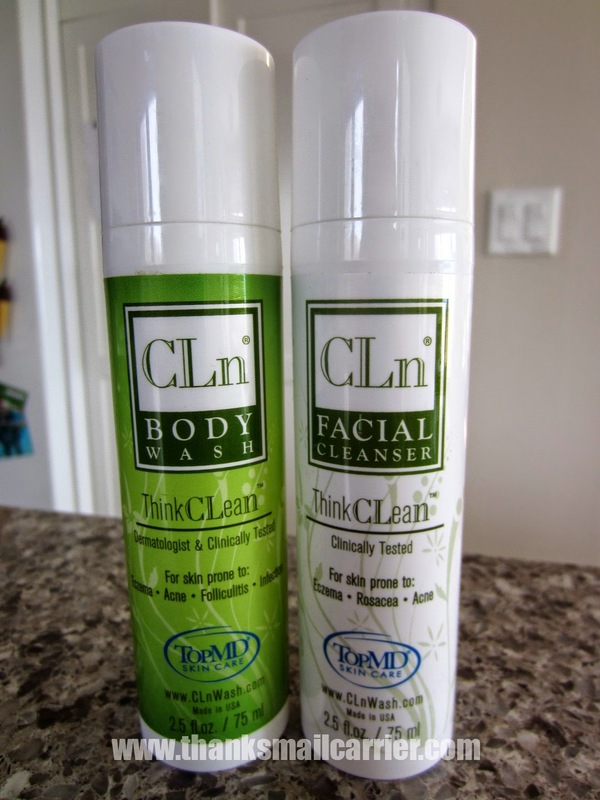 Both the CLn BodyWash and Facial Cleanser have proven to be gentle, moisturizing, fragrance-free and efficient! To find out more about the variety of CLn Skin Care items offered in their line, visit the CLn Skin Care website and connect with them on Facebook, Twitter and Pinterest. I have very sensitive skin and I have to stay away from fragrances in products and always try to get hypoallergenic products. I have dry itchy skin and these products look amazing. I bet they help very well! CLn® looks like a great product line. They have great gentle cleansers for problem and/or sensitive skin. I would love to give the CLn® Facial Cleanser a try. Thank you for sharing this review. I love reading the reviews about products to find new items I would love to try. I would like to try the facial cleanser. Looks like these have my name on them. This looks like a great product. I don't have a real problem but my poor daughter does. Thanks, I'll pass this info along. My spouse could really use the body wash, and I like that it's fragrance-free, because sometimes if he uses a scented wash it triggers my asthma. I'm going to look for the CLn BodyWash when I'm out shopping next week. Thanks for the review! I have eczema and very sensitive skin. I have to watch everything I use on my skin because I can break out with hives due to chemicals, dyes, etc. added to different lotions, washes, etc. This sounds like it might be just what the Dr. ordered. thank you for the review. I am going to look into this. I swim 3 times a week and could use these products.